Russian Curler's 'B' Sample Confirms Doping Result; Bronze Medal In Jeopardy : The Torch "We express our sincere regret over the fact of this incident," the Olympic Athletes from Russia team says. The team says it will investigate, to see how a banned drug came to be in his system. Aleksandr Krushelnitckii, seen here competing with his teammate and wife Anastasia Bryzgalova, has tested positive for a banned substance, the Olympic Athletes from Russia says. The pair won a bronze medal at the Pyeongchang Winter Olympics. 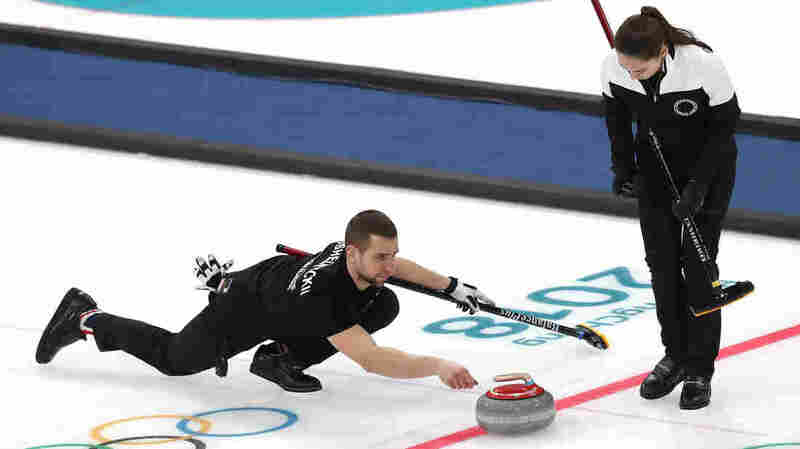 Russian curler Alexander Krushelnitckii, who won a bronze medal at the Pyeongchang Olympics, has tested positive for a performance-enhancing drug at the Winter Games, a spokesman for the Olympic Athletes from Russia team says. The team says it will investigate to learn how the banned drug came to be in the curler's system. OAR spokesman Konstantin Vybornov issued a statement on Tuesday saying that the "B" sample, which had been opened for testing yesterday, had returned the same result as the "A" sample: a positive for the presence of meldonium. The drug, sometimes prescribed to treat heart conditions, is believed to boost athletes' recovery. "We express our sincere regret over the fact of this incident," the Russian spokesman said. While Vybornov acknowledged that the test confirmed the presence of meldonium in the curler's system, he added that an earlier test had been negative. "The samples taken from Alexander Krushelnitsky prior to the Olympic Games, on January 22, as well as the preceding samples, tested negative. Thus, the fact of a conscious or systematic use of the banned substance is not confirmed," Vybornov said, in a translation by state-run Tass media. He also said that meldonium is known to be effective only if taken consistently. The Russian Olympic Committee will investigate the matter to learn the circumstances, Vybornov said. The findings could jeopardize the bronze medal Krushelnitckii won as part of a mixed doubles team with his wife, Anastasia Bryzgalova. A formal doping case was opened against the curler on Monday, by the anti-doping division of the Court of Arbitration for Sport. International Olympic Committee Communications Director Mark Adams has said that in the case of a positive test result, the OAR Implementation Group would be expected to submit its report on the matter to the IOC's executive board by the end of the Winter Games. Meldonium is the same drug for which Maria Sharapova tested positive, resulting in a lengthy ban from tennis in 2016 — the same year the the substance was placed on the prohibited list. The World Curling Federation says it is aware of the case, but that since it is an ongoing inquiry, it will not comment. The testing was handled by the Doping-Free Sport Unit — which is part of the Global Association of International Sports Federations, an IOC-recognized group that's based in Switzerland. World Curling Federation President Kate Caithness is a member of the GAISF Council.